Lookout, a company that offers security services for a number of smartphones, has raised $40 million in new funding led by Andreessen Horowitz. Current investors Khosla Ventures, Accel Partners and Index Ventures also participated in the round. Andreessen Horowitz’s Jeff Jordan from will join the company’s Board of Directors. This brings Lookout’s total funding to $75 million. The fact is that as more and more consumers adopt smartphones (a number in the billions by 2015, according to Gartner), these devices are at risk for mobile app malware, phishing scams, drive-by downloads and malicious sites on mobile browsers. Similar to the way consumers protect their computers, there is a need for an application that protects smartphones. Lookout has basically dominated this market with an easy to use offering. For background, Lookout’s web-based, cloud-connected applications for Android, Windows Mobile and BlackBerry phones help users from losing their phones and identifies and block threats on a consumer’s phone. Users simply download the software to a device, and it will act as a tracking application, data backup and a virus protector much like security software downloaded to a computer. 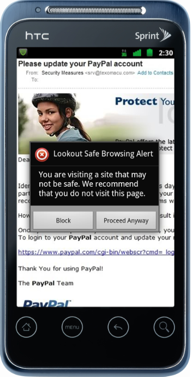 Lookout also offers a mobile browsing application that will automatically check every website a user visits, from an app, email, or browser on a mobile phone, to prevent phishing sites from stealing personal data and malware from being installed on a device. It promises the same sort of security that many browsers offer on the desktop (but enhanced for mobile devices). In the past year, Lookout has grown to 12 million users, and is now adding 1 million users a month. Lookout’s app is actually powered by Lookout’s Mobile Threat Network, which constantly analyzes global threat data to identify and quickly block new threats with over-the-air app updates. Threat detection that would have taken days now happens in minutes; effectively protecting users before they even know a threat exists. The Mobile Threat Network is powered by a dataset of over 700,000 mobile applications that grows daily as more applications are added to app stores around the world. On average more than 1000 apps are added to the Mobile Threat Network daily. The company has been able to tap into an enterprise business by offering this threat network through an API. Basically, Lookout’s Mobile Security API can extend its protection available to any app store or download site. Verizon was the first carrier to use the Mobile Security API to provide customers with V CAST Apps with real-time protection against threats to the applications they download from Verizon’s mobile storefront. The API works on the backend of the App Store, to determine if any apps contain malware or other security threats. Sprint, and T-Mobile are also using Lookout’s API. And considering that three of the top four U.S. carriers are now using lookout, perhaps the fourth (AT&T) will join soon. Jordan says of the investment: Mobile is rapidly becoming the dominant computing platform and as users do more with these devices, security is essential to keep them safe…Lookout understood from the beginning that mobile security would require a dramatically different approach. By moving security detection and analysis to the cloud, they have delivered a great user experience while building the fastest and most robust security infrastructure. Its tremendous growth is a testament to its success. John Hering, CEO and co-founder of Lookout, tells us in an interview (you can watch below) that the new funding will be used to expand to international markets, for product development, hiring and to develop similar carrier partnerships outside of the U.S. “The goal now is how do we get to 100 million users,” says Hering. And he believes that can happen soon. “We’re orders of magnitude bigger than our competitors including Symantec, McAfee, and our growth in revenue is substantial,” he explains. “We are generating real revenue from consumers and the enterprise.” Hering declined to reveal revenue for the company. He added that Lookout will be announcing a number of new operator partnerships in the future.